Orange is one of the colors that I tend to associate with autumn. Some leaves are already turning orange and pumpkin decorations and displays have started to appear on my neighbors’ doorsteps. As I was exploring Occoquan Bay National Wildlife Refuge yesterday morning, my eyes detected some motion in the nearby grass. 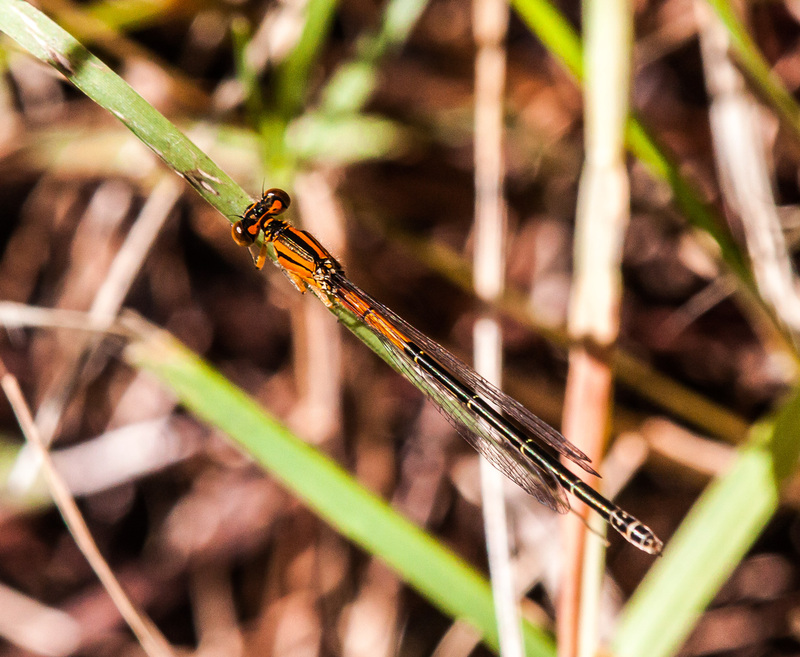 I leaned forward and was delighted to see this tiny damselfly decked out in the colors of Halloween—orange and black. I had no idea what species it was, but fortunately I have a really good guide for damselflies and was able to identify it as an immature female Eastern Forktail damselfly (Ischnura verticalis). Although there are already lots of symbols for autumn, I think this tiny damselfly could be added to the list. © Michael Q. Powell. All rights reserved. It was definitely a delight. Most of the damselflies that I see are blue, with an occasional brown female from time to time. An orange one was a nice change. The colour of autumn indeed – I’m delighted with your lovely find Mike! © 2012-18. All written content and photographs on this blog are the property of Michael Q. Powell. You may link to the site but written content and photographs may not be used without my written permission. Thank you! Ménage à trois or just friends?